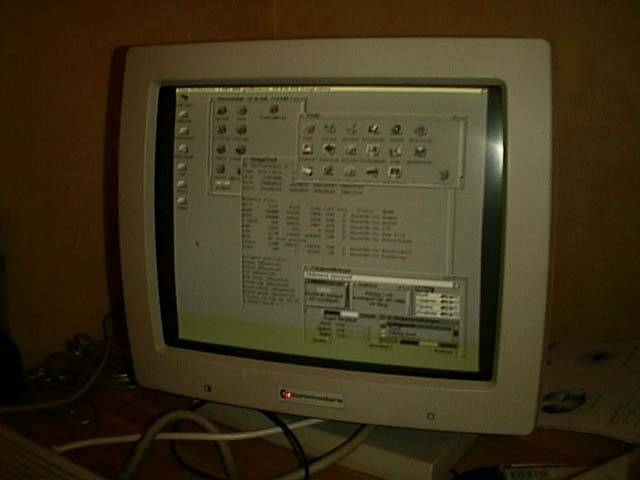 A 15" Amiga monitor, a 19" version may have existed but this has not been confirmed (Confirmed by Beth Richard oct 2013). The A2024 ( The A2024 was also known as the "Hedley Hi-Res" monitor as it was designed by Hedley Davis) is a monochrome monitor with four greyscales in A2024 mode and eight grey-scales in conventional modes. In addition to the native resolutions it also provides 1024x1024 on PAL screens and 1024x800 on NTSC screens. There are both PAL and NTSC versions of the monitor, although both models support PAL and NTSC frequencies if adjusted correctly. The monitor is quite unique in that it contains an internal framebuffer which is controlled via the RGBI lines of the video port, which means it probably won't work on anything but an Amiga. As there's no pixel clock, the exact sample rate must be fine tuned at the back of the monitor, much in the same way you do with scandoublers and flicker fixers. The monitor manages to achieve the high resolutions by effectively buffering four Amiga screens, whereby each screen displays a portion of the overall picture. Because of this, the "effective" refresh rate decreases to around 10-15Hz (software configurable), whereby the 10Hz mode uses 16 colour low-res and the 15Hz mode uses 8 colour hi-res. It seems that the monitor by be able to individually refresh the separate quadrants of the screen, as the quadrant which contains the mouse cursor appears to be updated more frequently. This may not be technically true, but perhaps just an illusion. The monitor itself runs at a vertical frequency of either 50Hz or 60Hz with a fixed horizontal frequency of 60Khz. NTSC modes tend to suffer less from flicker compared to the PAL modes. Page contributors: Beth Richard, John Hertell, Nils Petersen, Ralph Ewers.